We’re Amazing 1, 2, 3! April is Autism Awareness Month so this is a great time to educate your community about autism. Spreading autism awareness is a great way to celebrate April and promote inclusion and acceptance in the classroom and beyond. And we are going to celebrate April by reviewing We’re Amazing 1, 2, 3! It is a great book which focuses on Autism which may affect as many as one in forty-five children. This book celebrates the differences among children wonderfully through a beautiful story. This book can be used in a classroom to teach younger kids about Autism. This book will also be helpful to kids who are dealing with autism. 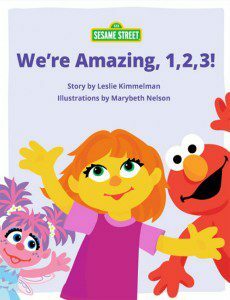 This story book by Leslie Kimmelman stars Elmo, Abby, and their friend Julia, who has autism. Julia is the newest Sesame Street character who has been introduced in storybooks of Sesame Street as part of a campaign to take the stigma away from the disorder. Julia is introduced as one of Elmo’s longtime friends and the two of them share many favourite activities, even if they approach them differently. Where Elmo enjoys building block towers and then knocking them down, Julia likes to line up her blocks in a row to build a wall. They both play with toy cars, but Julia especially likes to spin the wheels on hers over and over again. Both of them go to a playground, where Elmo introduces Julia to his other friend Abby. When Julia doesn’t answer or make eye contact, Elmo steps in to explain why. Elmo remembers his dad telling him that Julia has autism so she does things a little differently. He explains to Abby that sometimes he talks to Julia using fewer words and says the same thing a few times. Julia sometimes avoids direct eye contact, flaps her arms when she’s excited, and is sensitive to some noises. But Abby soon learns that she also has a lot of things in common with Julia. It teaches how all kids want love, friendship, and to have fun! They are all wonderful, each in his or her own way. This book is a treat for the entire family with great pictures to stimulate the interest of children and life lessons for everyone. The author of We’re Amazing, 1, 2, 3 had a child diagnosed with autism 20 years ago. Kimmelman says that today there’s a lot of awareness about autism. However it is still a puzzle, and every child is affected differently. This story book focuses on the most important thing we all should know that we’re all different in some way or another and that’s what makes the world an interesting place! Give your child an access to We’re Amazing 1, 2, 3! and over 20,000 more great books for free for two months! Click on the banner below and use the promo code Jedlie to try Epic for free for two months.